Time to change eras, so this build will be the M119 towed 105mm Howitzer. The 1/35 scale kit is by Mouse House and is an all resin kit. I will set the kit with the 25ID at firebase Alpha in Afghanistan. The kit has only 52 parts and should be simple....big mistake!! Drawback, the directions that come with the kit boarder somewhere between bad and horrific. Just a series of out of focus or very grainy photos with part numbers and arrows. If it was not for Prime Portal, other photos and my old TM, the model would be next to impossible to assemble properly. The model is shipped in a plastic bag, and is in serious need of a small box to protect the small and fragile parts. The parts are LOADED with flash, some parts with gels and fisheyes and as you will see, hollow due to air bubble. I replaced the axle with a scratch built axle made from styrene rod and thin sheet for the brake handles. On the good side, it is a nice little kit. 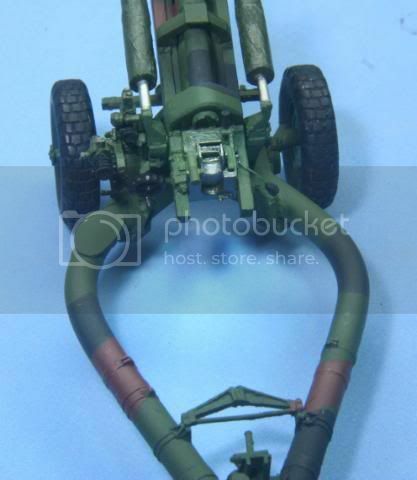 No one else makes a 1/35 scale of this howitzer, some details are quite good. Here is the base trail assembled and ready for priming. Here is the cannon and yoke after a bunch of fill work to fix the casting problems. Well we are off for priming and getting some base color in those hard to reach places. Try not to breathe too hard on it! Subfixer - I'm turning blue just trying to finish!! 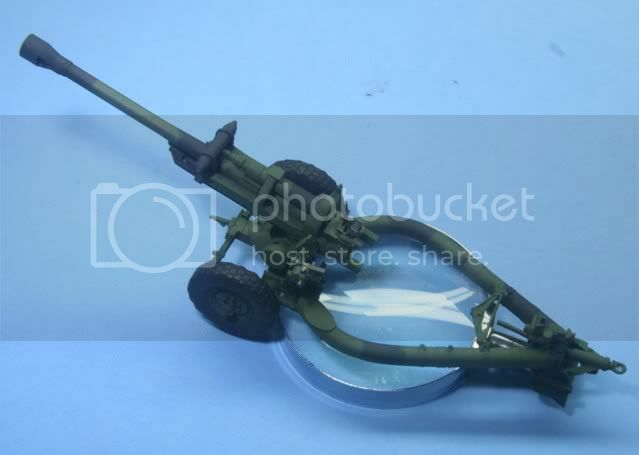 ps1scw - Well the allure is that it is not made in styrene (1/35 scale). 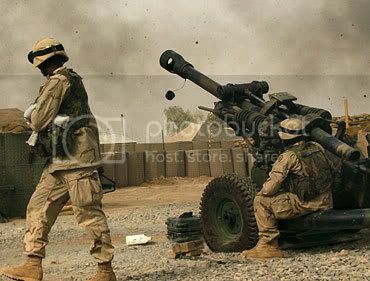 My allure is US artillery. With that I'm stuck, but I'll make the best of it. I'm sure you'll make it look great, I guess I just don't have the patience for it. WOW Mike! Give it your best shot... I'm sure that in the end, that it'll be another beauty to add to your collection! 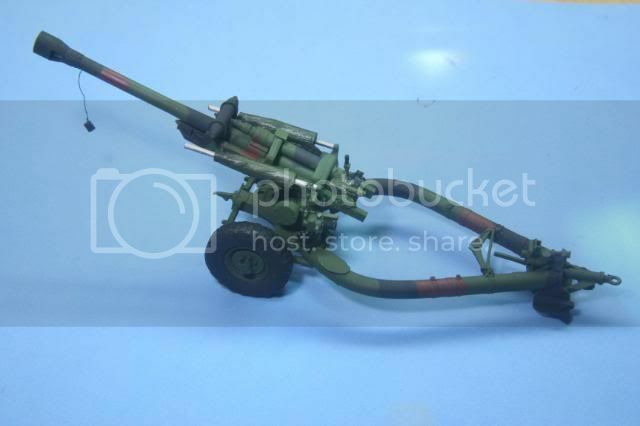 I think that the 119 is the coolest looking light howitzer around and I'm looking forward to seeing you do wonders with this kit as well! It's putting up a good fight Mike but I'm sure you'll persevere with it and beat it into submisison. Looking forward to what you do with this one. Resin is one of those things that can be hit or miss depending on the castings and storage conditions, and of course, packing and shipping. When it's the only game in town, you don't have many options for some subjects, especially for things like modern artillery and softskins. I'll be watching this with great interest too. 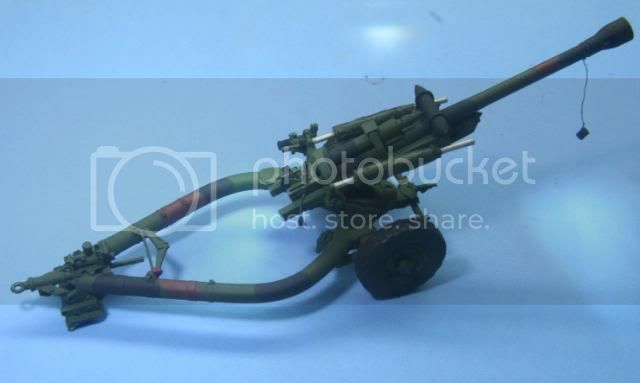 I'm not much into artillery but I do like to work with resin after a building few 1/16th conversions. It looks like you worked over the barrel and the recuperating cylinder pretty well. Sorry to hear about the trashed axle, but the platform/mount looks like a very nice casting. 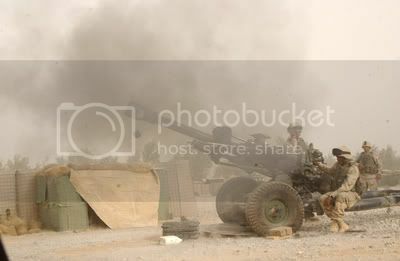 Your Howitzer looks like a winner, especially with the "In Action" pics. Thanks for posting. Guys - Thanks for the confidence. It's never over until it's over, just a period of frustration , but I don't believe in giving up or putting a kit back on the shelf!! Gino - Yep, I would figure even before you tried one, just as I finish, the styrene version will come out! 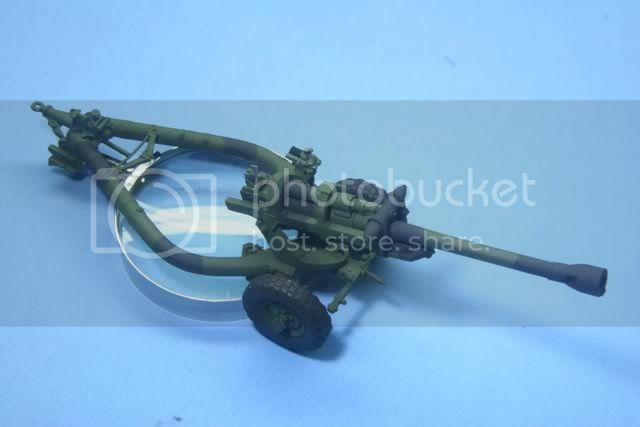 You mentioned the M198....did I miss something...is there a styrene version coming...would be nice! 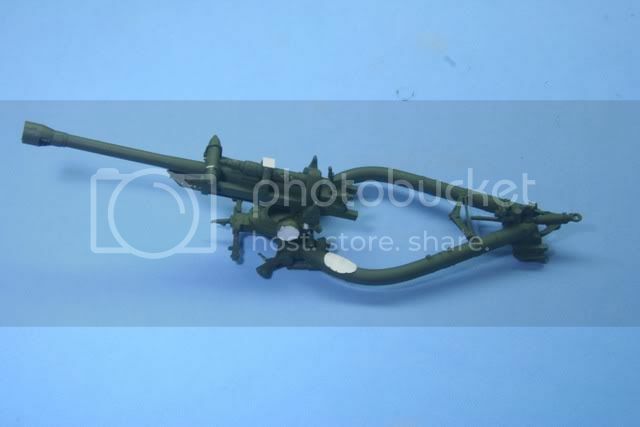 You mentioned the M198....did I miss something...is there a styrene version coming...would be nice! Yup, one coming from Trumpeter. Looks good too. Check it out here. Just as soon as I build 1 each of ALL the plastic ones first. Gino - I missed that one....looks great....guess the resin one in the stash is time to sell! Hopefully the M198 and the M1078 come soon. Also looking forward to the M1028 MGS. finally some good stuff for the OD minority!! Here we are a week later. Here is where I am at so far. I would like the group to know, I have been in contact with Mouse House, the kit manufacturer, and I have traded numerous emails on my problems with the kit and he is open to the assistance and looking to improve his product. The two main assemblies were joined. Continued filling and sanding all the resin imperfection. Before adding some details which would make painting difficult, I primed and base coated the model in NATO Green. After the camo, I added the wheels, detailed the breach, added the hand wheels and started adding the sights. Still to go are the equilibrators (big springs on either side of the tube that gives assist in elevating), finish the sights and the base plate assembly. Then it will be onto the display. That's it for now. Thanks for looking. All comments welcome. Looks great Redleg. You definitely made a silk purse out of a sow's ear. Great job. Can't wait to see it finished. 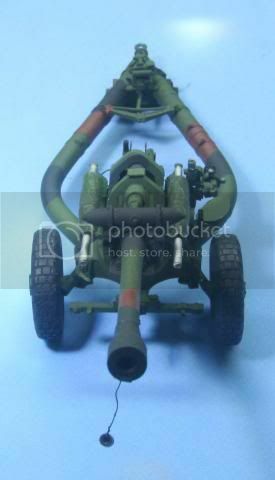 Your 105 Howitzer is looking good. I am glad to hear the manufacture is responding to your input over the issues you have had with the kit. I thank you for letting me know what the equiliberators are for. I think that it looks great Mike! Neat looking arty piece for sure and you've turned it into a beauty just as I knew you would. I love the crispness of the black camo paint but... is there no brown (NATO 3-Color) to be added or am I just jumping the gun here? 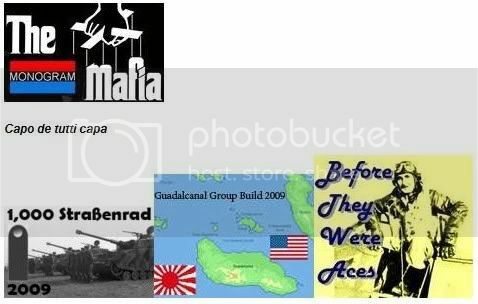 Got anything in mind to go along with it... ie: HMMWV etc? Mobius - Thanks for your comments, as far as the equalibrators, knowledge is power only if you pass it on. Thanks for giving me the power. Kevin - I was going to use a Hummer but decided to do the fire base picture you see at the thread beginning. 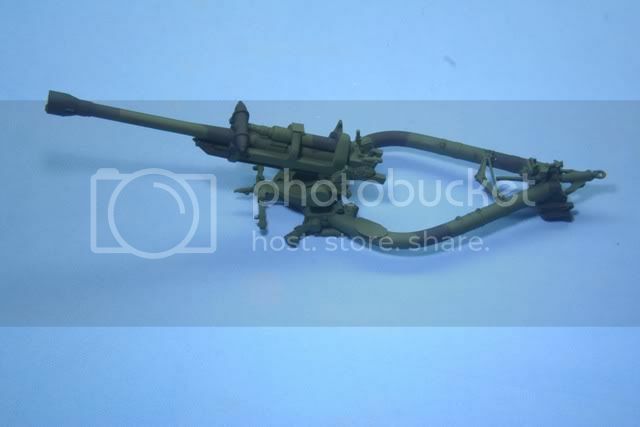 Sooo...after the kit I need to scratch build the wall, ammo area add some ammo and crates and my favorite, the muzzle plug with the idiot cord on it. As far as the color, all the shots I have seen of the M119 only show black and green. I know NATO has the third color, tan but it is either so little or the weapons are so dirty, I just dont see it. At 1/35, there is not much space for the third color anyway. 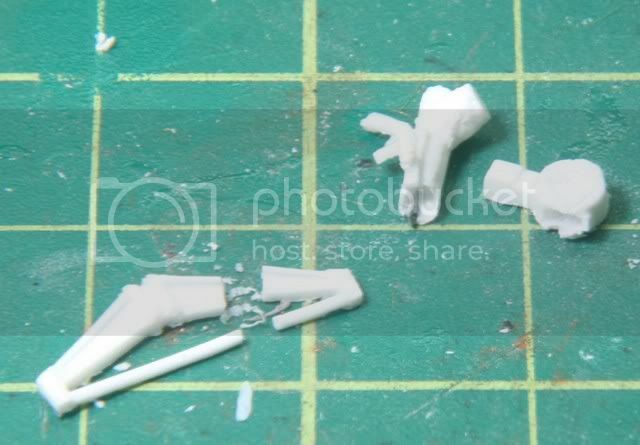 Nice looking piece there, Mike; I give you kudo's for tackling a resin kit as well. As psc1w said, it's never been my thing either, but you've persevered and made a good looking little kit! Gonna put some guys around it? wow that thing is tiny. great job on the resin. i will waite for the plastic version to come out someday in our lifetime, are yo going to put this in a dioroma? GA - I am going to try to replicate the picture at the start of this thread!! Thanks for your comments. You gonna do an M1069 prime mover for it, or is it there but "out of frame"? Sir, Beautiful rendition of of the 119! How hard was this resin piece to build? 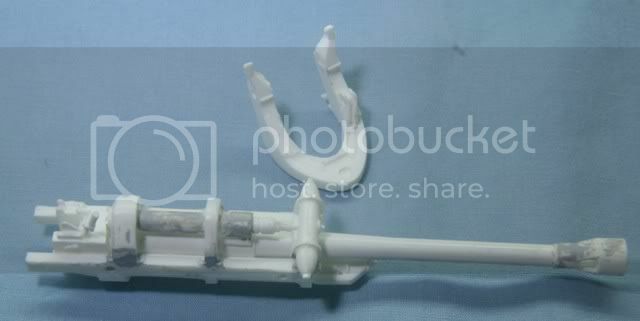 Doc - Many resin kits like Verlinden or Hobby Boss are commercial kits and usaully well made. You just have to get the knack of dealing with resin. This kit is by a small operation out of Austrailia. Since it is the only M119 on the market, well I was stuck. He is using a more primitive casting process so some of the parts leave a little to be disered on quality. If you are looking for a rivet counter type model build....this is not it. If you are looking for something that with some TLC, will look good and make an interesting dio, this is fine. I would suggest you work with some resin assemby on a smaller scale before you tackle a resin kit. Especially at some of their prices. Try an add on kit or a trailer. They are cheaper and you can gain some experience. Im Not much of a resin guy either but like you say when its the only game in town,, still it looks like you have done a great job on it from here MIke looking forward to seeing more. Working with resin is differnt than plastic. I am stuck with resin for this one (and some others in waiting). Like I said, it won't be a rivet counter type build but if it looks good and is generally correct, it will make the overall build. This week I completed the assembly of the sights and equilibrator, added a lanyard, then painted some NATO Brown to the camo scheme(thanks Hans). Then I finished a few touchups, and the M119 is now ready to mount the base plate and weathering. I will wait on the base plate and mount the M119 to the model base and the mount the M119 on top of the base plate. Also need to make a decal with the unit number and one for some barrel art. Here is the finished and painted assembly thus far. While we are waiting for paint to dry, I went into the wood shop...(next door to the bench room) and made up a base, then stained and coated the edges. I moved on to the barrier wall (see photos at the start of the thread). 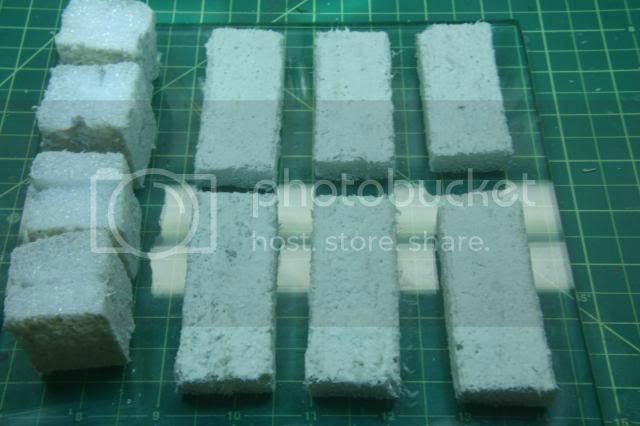 I am making these by cutting Styrofoam to size, then covering with Celluclay. Once the Celluclay is dry, I will cover with tissue to give the bag look and then cover with screen. But that is still to come along with a bunch of other emplacement accessories.